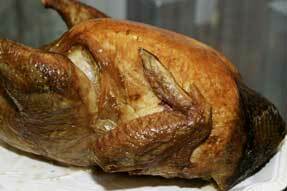 So you want to cook the a roast turkey but lack the confidence or the know how? Hub-UK takes you through how to cook a roast turkey dinner in a step-by step guide of preparing your turkey (for the Christmas dinner or for Thanksgiving) . . . from planning the meal to finally pouring the gravy! COOKING TURKEY - FROZEN OR FRESH? This often boils down to cost. Fresh turkeys are more expensive and they have more flavour. The texture and moistness of the meat will also be better. This does not mean to say that you cannot have a frozen turkey that also tastes good . . . fresh is just better. You also do not have the worry of making sure your turkey is properly defrosted. One of the problems I have found over the years is that frozen turkeys tend to have drier meat. You will cover your turkey with either bacon or butter but this will not make the meat of a frozen turkey any moister. A trick I picked up many years ago was to add some apple, onion and carrot to the cavity of the bird (I always do my stuffing separately) - just quarter the onion and the apple and chop the carrot into three and insert. The secret to cooking a delicious tasting turkey is in the planning and getting the cooking times right. If you are going to stuff your turkey Weigh it after you have stuffed it. Cover the breast with strips of bacon or smear with softened butter then cover loosely with foil. 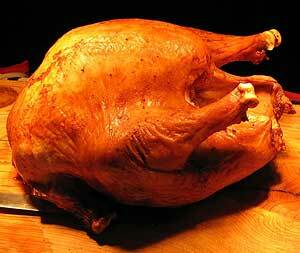 If your turkey weighs less than 4 kg then cook for 20 minutes per kg then add another 70 minutes cooking time at the end. 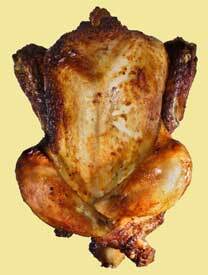 If your turkey weighs more than 4 kg then cook for 20 minutes per kg and add 90 minutes cooking time at the end. Remove the foil for the last 40 minutes to brown the top. Ovens vary, so always test your turkey to make sure it is thoroughly cooked. Cover with tin foil and allow the turkey to stand for 20 to 30 minutes in a warm place - it will keep warm and will be easier to carve. It is very important that you allow the turkey to defrost properly before cooking so make sure you plan ahead and leave enough time! When you come to defrost your turkey you need to think where you are going to keep it while it is defrosting. You also need to make sure it is kept covered - I shut mine in the microwave which I don't use much anyway! The ideal place to defrost the turkey is in the fridge but most fridges are not big enough, especially around Christmas when the fridge is so full of extra food. When houses had pantries or larders it was so much easier as they were clean and coo and an ideal place for defrosting. If you can't defrost in the fridge then the next best thing is a cool room, which could be your garage or shed as long as it is secure from rodents, etc and of course clean. Failing any of these you will have to defrost in a room at room temperature. Work out in advance the time it is going to take to defrost your turkey so that is is completely defrosted by the time you have to start cooking. If defrosting in the fridge it will take about 10 to 12 hours per kg. This is based on a fridge temperature of about 4ºC / 39ºF. If defrosting in a cool room below 17ºC you should allow 3 to 4 hours per kg. Again, you have to vary this depending on actually how cool the room is. If you are defrosting at room temperate, say 20ºC, you should allow about 2 hours per kg. These are only guides and if the temperature of your fridge or room is different then you need to adjust your defrosting time accordingly. Always check before serving that your turkey is cooked all the way through. You can do this by sticking a skewer or small knife into the turkey. Pierce the thickest part - this is usually the leg of a whole turkey. If any liquid comes out and it is clear then the turkey is done. If the liquid is pink or red in colour then the turkey needs to be cooked for longer. Fan assisted ovens are usually set approximately 25°C / 50°F lower than normal ovens and cooking time needs to be reduced by 10 minutes for every hour of cooking time. Different manufacturers and oven types do vary, so always refer to your cooker instruction book. You also still need to check for doneness! If you are unable to store your turkey in the fridge (fresh turkey or turkey after it has defrosted) you don't want to keep it in a warm centrally heated room or a hot kitchen for obvious reasons. Get a cool box or a cool bag, the sort you would use for summer picnics, together with a few ice packs (one in the freezer while one is being used). Keep the ice pack from actually touching the meat and remember that some liquid will still come out of the turkey. Ideally I would place the ice pack at the bottom and then a big plate to stand the turkey on. What do you serve with roast turkey? Turkeys should be stuffed prior to cooking and in order to save time on the day you can prepare the stuffing in advance. Depending on how far in advance, you can keep it n the fridge or freeze it (make sure you thaw it out). You should only stuff the neck cavity and never the body cavity. It has become more popular and easier to cook the turkey with the stuffing cooked separately. If you want to make these it is very simple as most butcher's and supermarkets sell a variety of different sausage meat mixes at this time of year. Simply take your sausage meat and roll it into balls approximately 1½ inches (4 cms) across. These can be cooked in the oven in a greased pan (they will release quite a bit of fat) for about an hour or they can be put in the roasting pan alongside the turkey. You can also deep-fry them. If you are pushed for oven space, which lets face it most of us are, you could cook yours sausage meatballs in advance and then warm them up in the microwave just before serving. Mix together the sausage meat and the breadcrumbs so that they are evenly mixed. Set aside. Melt the butter in a saucepan and then add the onions and sauté over a low heat until they soften. Add the dried thyme and parsley and sauté for another couple of minutes or so. Add the sausage meat and breadcrumbs to the onion mixture making sure everything is well blended together. Bake separately in an ovenproof dish at 180°C / Gas 4 for about 25 minutes and serve hot with turkey. You can also cook by stuffing the turkey or you can cook in advance and reheat in the microwave just before serving. 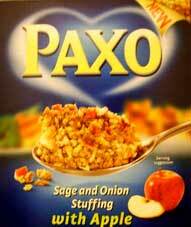 You can of course buy some good packet mixes although making your own fresh stuffing will taste a whole lot better. It is always a good idea to keep a packet of ready made stuffing in the cupboard in case of emergencies or if something goes wrong! Peel the onions, put them into boiling water and let them simmer for about 10 minutes. (This way of cooking the onion stops the onion overpowering the flavour of the stuffing). Remove the onion and chop finely. Add the breadcrumbs, dried sage, seasoning and butter and mix the whole lot together. Season well with salt and pepper and mix again. The stuffing can now be used to stuff your turkey (or other poultry) or placed in an ovenproof dish and baked for 30 to 40 minutes. If you want to make your stuffing a bit more exotic the addition of an apple and an egg will make a big difference. Core, peel and finely chop the apple. Add the breadcrumbs, dried sage, egg and butter and mix the whole lot together. Again you can buy some good bread sauce mixes in packets which can be useful if you are pressed for time or if something goes wrong but there is nothing like the flavour of home made bread sauce which is just as good afterwards, eaten cold on a turkey sandwich! Quarter the onion and stud with the cloves. Place the onion quarters with cloves together with the bay leaves and the peppercorns in a saucepan with the milk and bring to the boil. Simmer for five minutes and then remove from the heat. Cover and leave in a warm place to infuse for an hour or more. To make the sauce remove the onion, bay leaf and peppercorns. Stir the breadcrumbs into the milk and add half the butter. Put the saucepan back on a low heat for about 15 minutes, stirring occasionally, until the sauce has thickened. Season with salt and coarsely ground pepper. Place in an ovenproof dish and dot with the remaining then bake in oven for about 15 to 20 minutes before serving. If you don't want to make your own you can again buy some good quality, ready-made cranberry sauce but it still will not be as good as the one you make. It is easy to do and can be cooked in advance and stored in the fridge for several days. Place all the ingredients in a saucepan and simmer until the fruit has cooked and the liquid has thickened to a sauce consistency. Leave to cool when the sauce will become more solidified. Store in fridge until required. You will need a sufficient quantity of King Edward potatoes or other flowery variety, which will depend on how many people you are serving and whether you are serving just roast potatoes or roast and boiled or new potatoes. Peel your potatoes and cut them in half or quarter them depending on how big they are. Place in a saucepan, cover with water and salt. Bring to the boil and simmer for about 10 minutes. Drain in a colander and leave to dry over the warm pan they have been cooked in, with a lid on. Preheat some dripping in a roasting pan - to a depth of about half an inch. Toss your potatoes vigorously in seasoned flour so that the edges start to break up a bit and they are covered in flour. Place them flat side down in the hot fat and baste. They will need to cook for an hour, turning and basting them half way through. The ideal temperature is 220°C so it is best to do them towards the end of cooking your meat and as soon as the meat is out of the oven turn up the temperature. (Your meat will keep warm for a long time if you wrap it in a couple of layers of tin foil before carving it). There are two sorts of potato, waxy and floury. Waxy ones are easy to boil. Floury ones can also be boiled and often have more taste, but if you over cook them they will start to disintegrate. If buying from a supermarket most bags will tell you what the potatoes are best used for. 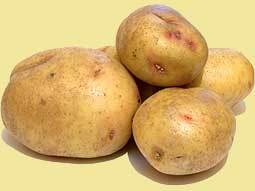 Peel your potatoes and cut them in half or quarter them (depending on size) so that they are all about the same size. Place in a saucepan and completely cover with salted (about a heaped teaspoon) water. Test to see if they are done insert a small kitchen knife into one or two of the larger pieces. If the knife goes in easily then they are cooked. If it is hard to push the knife in then they need a couple more minutes. Once cooked drain the water and either keep warm or serve. These will be smaller in size so you may not need to cut them although they should all be of a similar size so tat they cook at the same time. Cook as for boiled potatoes but you should not need more than fifteen minutes. New potatoes can be cooked in their skins. These days most new potatoes (unless you grow your own or buy direct from a grower) are very hard to peal so cooking with the skin is the only option. They still taste good and they retain all their goodness. Everyone is an expert when it comes to making mashed potato so I will just tell you how I do it and leave it at that. Take approximately 2.5 kg of potatoes and cook as above for boiled potatoes. Do not let them over cook as otherwise they will be too mushy! Once cooked, drain and add about 50 gm to 75 gm of salty butter and leave to melt. Then with a masher start squashing your potatoes. When you have roughly broken them up add some milk and continue to mash. Keep adding milk (you can also add some double cream to make them richer) and mashing to achieve the consistency you want. Only add milk or cream gradually as otherwise you might overdo it and your mashed potato will be too runny. 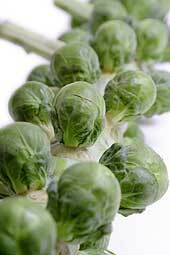 These have to be the UK's favourite Christmas vegetable and Christmas would not be Christmas without them. Sprouts have plenty of flavour and good quality can be obtained from the supermarkets but do not fall into the trap of buying them too early, as they will start to lose their freshness. Also buy them loose so you can make sure you are not buying poor quality ones. As usual fresh is best and for this you are either better with buying from the Veg stall at your local market or from a farm shop. When buying your Brussel Sprouts buy them loose and try and select small compact sprouts all of the same size. Having them all the same size ensures they all cook at the same time. To prepare the sprouts remove the outer leaves and trim the stalks. There is no need to make an incision in the base of small sprouts as this is only done with sprouts that have grown too big and are more difficult to cook. Cook in well salted rapidly boiling water without a lid one which will help to preserve the green colour of the sprouts. The sprouts will cook in about ten minutes. Keep an eye on them because you want them tender but not starting to go too soft. At this time of year carrots are going to be winter stock and not the tender young things that can look so appetising in the summer. 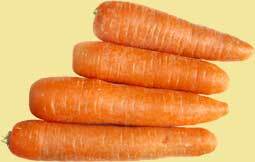 But for those of you who like carrots they are still a great vegetable to accompany any roast dinner. 450 gm carrots will be enough to serve four but if you are doing several vegetables you will not require such a big portion for each person. Peel the carrots with a potato peeler and remove the top and bottom. Cut into 1 inch pieces. Drain through a colander and then put back in saucepan. Add a good knob of butter and mash. Roast parsnips make a lovely winter vegetable and provide an added flavour to a roast meal. One parsnip will be enough, if not more than enough, for each person. Peel the parsnips with a potato peeler and remove the top and bottom. Quarter the parsnips lengthways and if the parsnips are big cut out the woody central core. Boil the parsnips in salted water for about ten minutes. Heat some dripping in a roasting pan and toss the parsnips in the hot fat then roast in the oven for about 30 to 40 minutes basting halfway through. 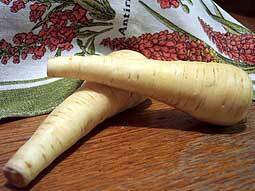 Another of those wonderful traditional winter root vegetables. Peel the swede with a potato peeler and remove the top and bottom. Cut into equal size chunks (about 1 inch) and boil in lightly salted boiling water for about 15 minutes or until tender. Drain through a colander and then put back into saucepan, add a good knob of butter and season well with freshly ground black pepper. Mash thoroughly and serve. 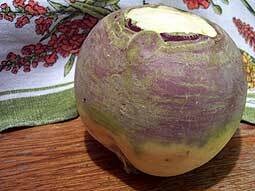 Have you tried cooking half swede and half carrott? Cut them to a similar size and when they are cooked mash them with plenty of butter and freshly ground black pepper. Aaah! Mushy peas . . . a great British delicacy! I did write to Leo's (manufacturers of processed peas) once to ask from where Americans could buy mushy peas. They replied that the American public wasn't ready for them yet! You can now buy mushy peas in a tin if you wish but the best way of making mushy peas is to buy a packet of the dried processed peas that you have to soak overnight. Forget the non-soak versions. They are not as good. Ignore the cooking instructions on the packet (still soak the peas overnight as instructed) because you are going to put them in a large pan of boiling water and cook them until tender. You then continue to simmer them until they reduce down to the consistency you want. I always start them cooking at least an hour before I want them as they will keep warm and are also easy to warm up again. No roast dinner would be complete without a good helping of gravy. There are several ways of making gravy but many people have been put off by a bad experience. It was lumpy, it was too thin, it was too thick, it looked disgusting, it tasted disgusting . . . so out come the gravy granules! Whatever the reason for being put off, making your own gravy is the crowning glory of a roast dinner. For years I watched my mother struggle to make the gravy - it always tasted good but it was so full of lumps that she would have to strain it. And you wouldn't believe the mess that made, never mind the washing up and trying to get the lumps of gravy flour out of the sieve! The stock can be prepared the day before and kept in the fridge overnight. Place the giblets and all the other ingredients in a medium saucepan. Add 2 litres of water, cover, bring to the boil and simmer for two hours. 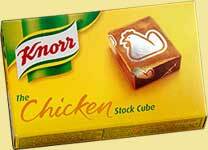 At the end of this time add two of the Knorr stock cubes and reduce down the liquid volume so that you are left with approximately 1.2 litres of stock (if it is less you can always add some water. Drain stock and taste. If required add third Knorr stock cube. Put stock aside until required. If preparing ahead, keep covered in fridge. Leave to cool for about 10 minutes. Add flour and whisk vigorously to make a smooth paste. Return to heat continuously stirring until simmering. Simmer for about a minute whilst continuing to stir. Start adding your stock gradually, stirring as you do so (I find it easier to stir with a whisk). Once all the stock has been added and it is simmering you can add a little more water if you feel your gravy is too thick. Add gravy browning and simmer for a further ten minutes before it is ready to serve. So that's it, Christmas or Thanksgiving dinner prepared and ready to eat. If you think we should have included other vegetables please let us know or if you have a question then email info@hub-uk.com.